Intelligent, independent, and eager to please, the Norwegian Buhund dog breed can handle all kinds of dog jobs and sports with ease. He needs lots of exercise and attention, and is a quick learner. 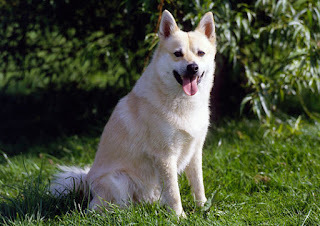 The Norwegian Buhund belongs to a large class of dogs called the Spitz type. Bred as an energetic working dog, Buhunds herd livestock and guard home and family. Today, they are also trained to aid the hearing impaired, perform some types of police work, and perform in obedience and agility trials. Their thick coat is wheaten or black in color. Skeletons of six dogs found at the excavation site of a Viking grave may have been forebears of today’s Buhunds. The Buhund was used by farmers to hunt or run off wolves and bears. This Norwegian farm dog, who guarded property, helped herd livestock, and hunted or ran off predators such as wolves and bears, is thought to have a long history. The excavation of a Viking grave dating to the 10th century turned up the skeletons of six dogs of various sizes. They may be the forebears of today’s Buhund. Over the years, Buhunds have escaped the bounds of their herding past to be trained for certain types of police work and as hearing dogs, as well as participating in agility and obedience trials. The dogs were first exhibited at dog shows in Norway in the 1920s, and a breed club was organized in 1939. The dogs were first imported to the United States in the 1980s. The United Kennel Club recognized the Buhund in 1996 and classifies him as a Northern breed. The American Kennel Club recognized the breed in 2009. He is a member of the AKC’s Herding group and ranks 159th among the breeds registered by the AKC. The Norwegian Buhund is vigilant, cheerful, active, untiring, intelligent and attentive. Very affectionate, it loves giving kisses and snuggling. This breed needs physical and mental stimulation and require consistent, firm leadership as it can be headstrong if it senses its handlers are not as strong minded as itself. These dogs like to be taught and learn very quickly. A natural watchdog, the Buhund is brave and vocal but not aggressive. It is unlikely to bite or snap unless provoked and led to believe it is alpha over the humans as a result of lack of leadership. Buhunds love their family and are known for their fondness of children. It is an ideal size for a house dog and a great people lover. This is a very trainable breed. The Norwegian Buhund is very active and needs a lot of exercise. It needs obedience training to establish reliable manners. If your dog tends to bark at you when it wants something it is a sign that your dog believes he is above you in the pack order, and you not only need to hush him, but you also need to reevaluate your canine to human leadership skills. A dog that believes he is alpha can be very stubborn. May try to herd humans and needs to be taught this is not acceptable. Fortunately, the Buhund is a healthy dog. There have been cases of Pulverulent Nuclear Cataracts, epilepsy and skin allergies reported in the breed. 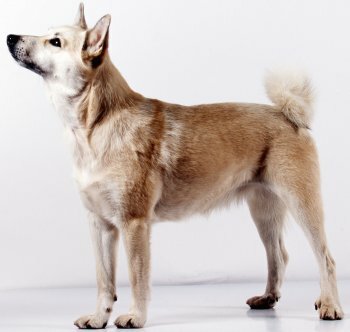 On the flipside, the breed has a very high incidence of hip dysplasia. Considering that the Norwegian Buhund is not a large breed of dog, breeders and enthusiasts are alarmed at this quickly increasing problem. 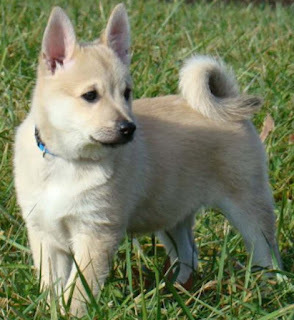 The Norwegian Buhund would do best living in a house with at least a small fenced-in yard. These dogs are very active and should get plenty of chances to exercise. They can, however, live in an apartment if extra care is given for sufficient exercise and the apartment is fairly big for the dog to move around. Norwegian Buhunds are highly intelligent dogs that have a strong desire to please their people. They are one of the easiest to train among the Spitz style breeds. They learn quickly provided the owner is consistent, gives plenty of praise and carries yummy rewards. Although he is independent and tough enough to herd and protect sheep on his own, the Buhund is offended by harsh words and responds well to assertiveness and kindness during training sessions. The Norwegian Buhund does very well in events such as obedience, herding and agility trials. This breed has also been used for service, search and police work. His versatility and intellect make him a great all around dog. This is a very active breed that needs to be exercised every day, with a long, brisk walk or jog. While out on the walk the dog must be made to heel beside or behind the person holding the lead, as in a dog's mind the leader leads the way, and that leader needs to be the human. In addition, they greatly enjoy sessions of play. The Buhund has a thick double coat. Brush it weekly to keep it clean and remove dead hair. The coat sheds some all year round and more heavily once or twice a year. During shedding seasons, which are usually in the spring or fall, daily brushing will help to keep excess hair under control. Regular brushing will keep the Buhund clean. It’s rare that he will need a bath. The rest is basic care. Trim the nails as needed, usually every week or two. Brush the teeth frequently with a vet-approved pet toothpaste for good overall health and fresh breath. 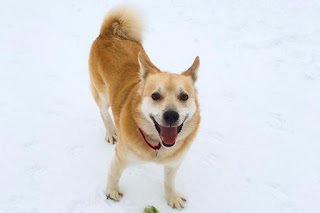 Is the Norwegian Buhund the Right Dog for You? Norwegian Buhunds are happy, active dogs who adore children and are very affectionate with their families. Although they do need a good amount of exercise each day, they are happy to settle down and snuggle in at the end of the day. They get along with other pets, too, and are regarded as a “people dog” since they are happy to meet anyone they can. Although heavy shedding occurs 2 times a year, regular brushing the rest of the year is all that is needed. The dogs do best indoors with a yard, but they can live in large apartments if they are allowed to exercise outdoors daily. There are only two health problems considered common for this breed, and when added with the minimal grooming they are easy dogs to maintain. They do need training, however, but they are easy to train. 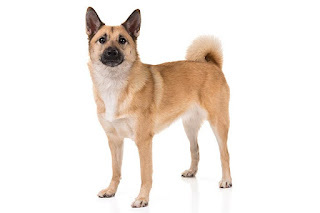 If you are looking for a playful, affectionate family dog with minimal grooming, good health and a love of children, consider the Norwegian Buhund breed for your next dog. In his homeland of Norway, the Buhund’s name means “farm dog.” He is also called the Norsk Buhund or the Norwegian Sheepdog.